According to the South African Petroleum Industry Association, about 20% of the country’s fuel needs are being met by refined product imports. These are expected to continue to increase, unless significant investments are made in the country’s six refineries. Some have argued that South Africa should take advantage of the global glut of liquid fuel refining capacity and rely increasingly on fuel imports. Government contends, however, that importing fuel is not positive – neither in respect of energy security nor for the enhancement of industrialisation. It also believes that a high level of refined fuel imports exposes South Africa to foreign exchange fluctuations and could place energy security at risk. Thus, much uncertainty remains in the domestic upstream and downstream oil and gas sectors. Creamer Media's Energy Roundup is a monthly report providing a synopsis of energy-related news from South Africa in the past month. The September 2017 roundup covers activities across South Africa in August 2017, and includes details of the Constitutional Court’s refusal of an application by several Eastern Cape businesses for leave to appeal a Supreme Court of Appeal ruling regarding the implementation of the Regulatory Clearing Account mechanism in South Africa’s multiyear price determination electricity tariff-setting methodology. It also includes the Energy Intensive Users Group proposal for structural changes to State-owned power utility Eskom’s tariff for large power users and the Organisation Undoing Tax Abuse’s charges against State-owned power utility Eskom’s suspended CFO Anoj Singh. An estimated two-thirds of the world’s population lives in areas that have water scarcity at least once a month, with about 500-million people living in areas where water consumption far exceeds locally renewable water resources. In fact, the High Level Panel on Water warned in a statement released on March 21, 2017, that the world might face a 40% water shortfall by 2030, affecting at least 1.80-billion people. South Africa could become one of these statistics, given that it is considered to be the world’s thirtieth-driest country. According to current projections, water demand in South Africa will increase by 1% each year from 15-billion cubic metres a year in 2016 to 18-billion cubic metres in 2030, resulting in a 17% supply deficit. Already, 30% of the country’s towns and cities have a water deficit and the situation is expected to be exacerbated by the effects of climate change. This edition of Creamer Media’s Water Report considers the aforementioned issues in not only a South African context but also an African and global context in terms of supply and demand, water stress and insecurity, and access to water and sanitation, and the challenges that come with these issues. Creamer Media's Energy Roundup is a monthly report providing a synopsis of energy-related news from South Africa in the past month. The August 2017 roundup covers activities across South Africa in July 2017, and includes details of the National Energy Regulator of South Africa's call for written comments on an application by State-owned power utility Eskom to implement a two-year incentive pricing package that will allow for the restart of ferrosilicon production in Limpopo and Mpumalanga; State-owned power utility Eskom’s sharp fall in after-tax profits; and the Democratic Republic of Congo’s decision to more than double the size of its planned Inga 3 hydroelectric plant. South Africa’s rail network has been neglected for decades and is considered an ageing and ailing system, particularly the commuter component. Commuters are increasingly shunning rail services in favour of minibus taxis, buses or private vehicle ownership, which is accelerating rapidly, as more people are progressing into the middle class. The fast growth of road-based transport is putting infrastructure under pressure, underscoring the need to continue to invest in road projects to provide extra capacity and shift more freight from road to rail. Creamer Media’s Road and Rail 2017 considers the aforementioned issues, with a particular focus on the size and state of the country’s road and rail infrastructure, the funding and maintenance of these respective networks, and efforts to transfer road freight back onto rail. As a major focus of minerals mining in the world, and an untouched treasure trove of natural resources, Africa has a sizeable and thriving mining industry. The mining sector does not only provide employment for millions of African nationals, but is also a significant source of foreign direct investment and earnings. According to mine and industry engineering company Ukwazi nonexecutive director Alan Clegg the commodities that are likely to provide a sufficient upward cycle, thereby sustaining investor interest in Africa, are precious metals, base and battery metals, and energy fuels. The burning question facing the mining sector, however, is whether, and how, it can make its full potential contribution to satisfy the ever-growing need for mineral resources while capturing the wider socioeconomic benefits from such development. This edition of Creamer Media’s Africa Mining Projects in Progress reviews recently announced scoping, prefeasibility and definitive/bankable feasibility studies on projects across the continent, as well as the projects that are under way. Creamer Media's Energy Roundup is a monthly report providing a synopsis of energy-related news from South Africa in the past month. 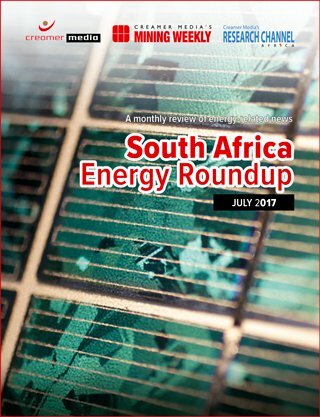 The July 2017 roundup covers activities across South Africa in June 2017, and includes details of the launch of agricultural company Senwes’s first silo solar photovoltaic system in South Africa, at its Hennenman silo, in the Free State; State-owned power utility Eskom’s new acting group CEO and Eskom board; and the continuing expansion of nuclear energy capacity worldwide. There is now no question that South Africa’s poisonous political environment is having a toxic effect on the real economy. Despite more supportive exogenous conditions for agriculture and mining, the country has nevertheless descended into its first recession in eight years. Indeed, the shift from external to internal causes is the key difference between the current recession and the one in 2009. Back then, the economic slump, which resulted in a million jobs having been shed domestically, was precipitated by a global financial crisis that had its origins in US’s subprime housing crisis. This time, the pain is mostly self-inflicted and driven primarily by ongoing political tensions and growth-sapping policy uncertainty. That said, parts of the economy continue to show resilience in the face of political headwinds. Some of this hardiness is reflected in this edition of the Real Economy Yearbook, which confirms the difficulties, but offers insight into those areas where there are signs of improvement. Creamer Media’s Real Economy Year Book has been divided into separate reports under the banner Real Economy Insight, and investigates key developments in the automotive, construction, electricity, road and rail, steel, water, pumps, coal, gold, iron-ore and platinum sectors. This nine-page brief is a synopsis of key developments in the platinum sector over the past 12 months, including details of the global and South African iron-ore markets, demand drivers, producers, new entrants in the platinum sector, wage negotiations and the regulatory environment, as well as the outlook for the sector. Creamer Media’s Real Economy Year Book has been divided into separate reports under the banner Real Economy Insight, and investigates key developments in the automotive, construction, electricity, road and rail, steel, water, pumps, coal, gold, iron-ore and platinum sectors. This eight-page brief is a synopsis of key developments in the gold sector over the past 12 months. It provides an overview of the South African gold market, including labour and electricity-related challenges, the gold price and outlook for the sector.